This is a small test piece for another potential project. knowing no 3d programs I had to use Photoshop to make my revolving planet - turns out it makes this kind of thing pretty easy. anyway - just a small technical victory for me that I wanted to share. Here are a small selection of clothes to go with the small items I have made. 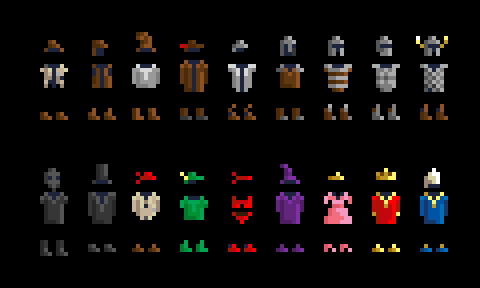 The top row consist of various peasant and warrior outfits, the second row are just a few slightly silly costumes. Can I get a 'hell yea!' for my red warrior bikini set? 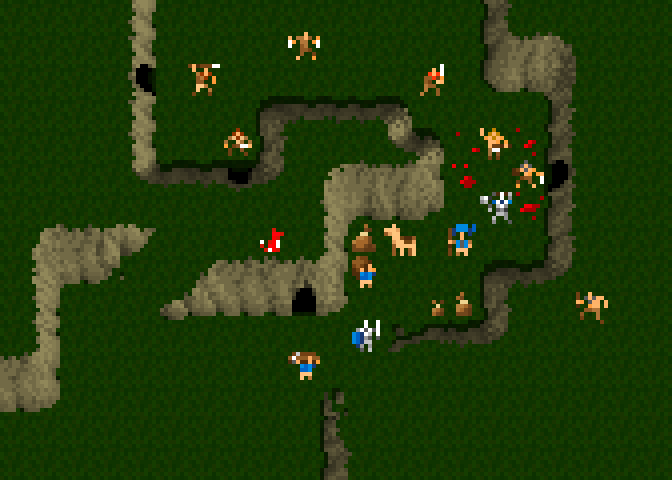 So far, for the latest version of the tileset I've had 148 downloads, that’s pretty phenomenal from my point of view and I'm proud that so many people have taken an interest in my little project. I've had a few people get in touch to let me know that they are working on something, and one Heroic Champion has even been sending me regular builds of their game! 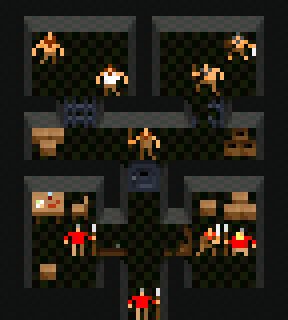 Over at Droidgnome Cursed Dungeons is gearing up for its first official release, and while still in the very early stages I think it’s shaping up to be a pretty tidy roguelike for Android. Droidgnome has done a great job of implementing touch screen controls and a nice minimal interface (half the battle for a mobile game) and solid level generation that throws up a nice variety of levels. You should go check it out, and if you have an Android device pile on the pressure for that public release. 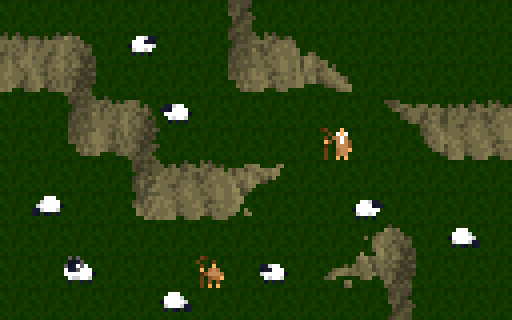 It has been incredibly helpful for me to see the tiles in action, seeing the sprites shuffle around, watching fires crackle and making doors and chests open and close has been more gratifying than a grown man should admit. 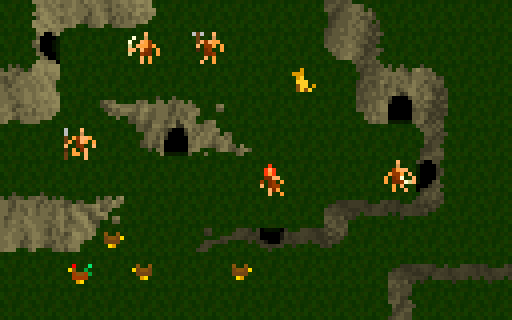 It’s also given me a chance to see whets missing from the tileset and what needs more work. All in all, its a world away from staring at my static Photoshop files for hours on end. So people, what are you working on? Show us your screenshots, send us your early builds, blog it, leave a comment or send me an email. I’d love to see what your making of the graphics and to hear what you need to complete the epic games of wonder I know you have hidden away. Remember folks - Sharing is caring! Last week I took part in the 7DRL challenge collaborating with Ido Yehieli of Cardinal Quest fame. It was my first time being directly involved in developing a game and I am immensely proud of the results. 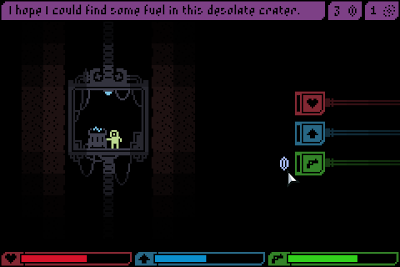 Is a coffee break roguelike set in space - the player has to traverse an abandoned asteroid mine in search of monopoles to repair their ship, collecting ice crystals to power their equipment along the way. For the competition we knew we needed a tightly focused gameplay mechanic and the hook we went with is a side-on game with gravity. To get around the player uses an anti-gravity belt, temporarily giving them free movement. Energy supplies are limited and your only chance to recharge equipment comes between levels so resource management is key to success. Anyway, thats enough from me - go check it out. All new item and interface tile sheet - this includes single tile items and some basic interface elements. 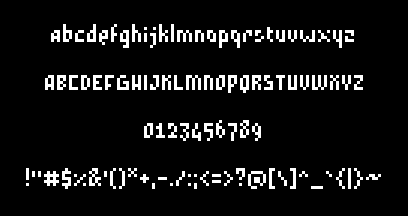 All new ttf pixel font - I am new to making fonts so let me know if you find any issues with the ttf. 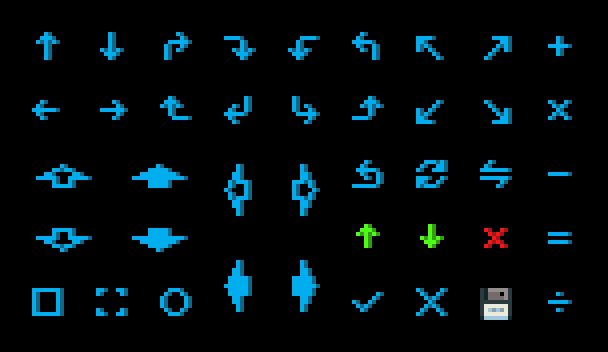 At the moment it's just basic Latin glyphs, but I will expand it over time. 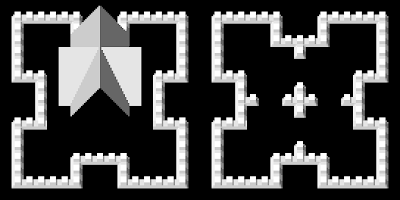 In previous downloads I have included a plain text index for each tile sheet. I ran out of time this time round so I have included a copy of my index spreadsheet instead - let me know if this is more or less helpful. Got a couple of new bosses here. I'm not making these in any particular order, so I still have most of the obvious creatures to do (dragons, cyclops and whotnot). 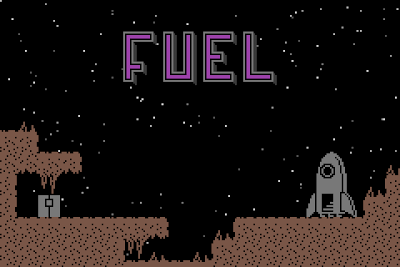 It just occurred to me today that as some of you fine folk may be planning 7dRL entries for this year, I should make a last ditch attempt to woo you! 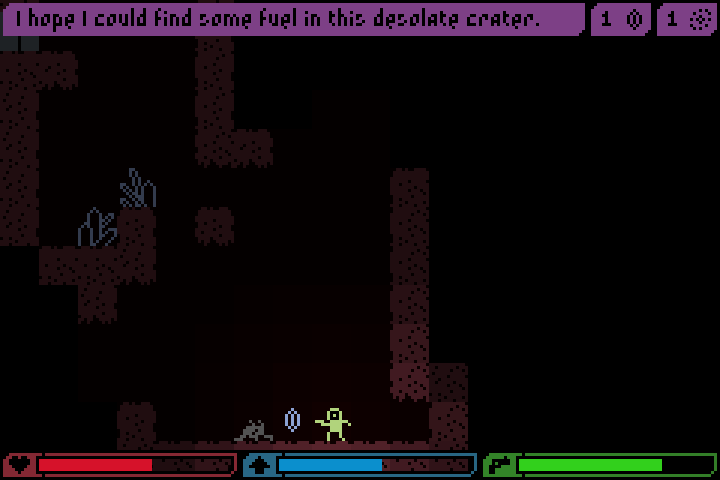 With that in mind, I'm going to try and get the next release of the tileset out this weekend. 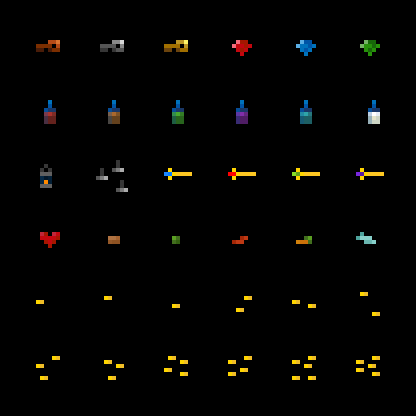 One of the main things that the tileset lacks at present are items. 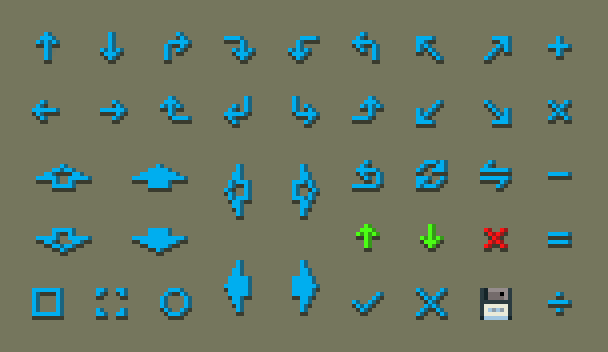 While I still intend to soldier on with my grand plan for a System shock inventory system, there will always need to be symbols for the stuff that is actually on the dungeon floor. 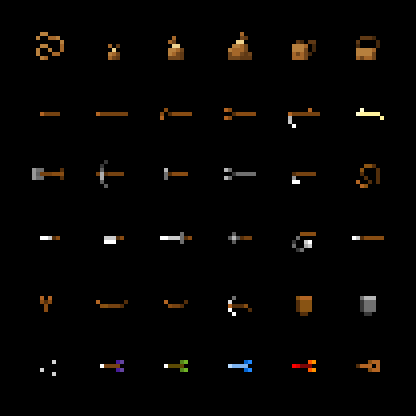 While I'm never going to depict 50 different swords within the space of a single tile, I at least need a symbol for swords as an item type. Anyway, here is what I have so far, If you cant make out what something is, or if you have any specific requests leave a comment and I'll try and get a reasonably complete set of bits and bobs ready for the weekend. I'm going to do a couple of minor posts on things I have shown but haven't blogged in there own right. First up is blood. 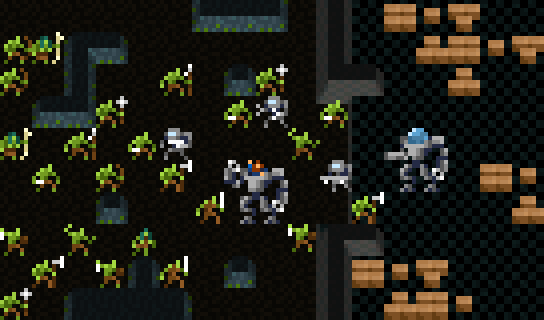 Although I don't want to tempt people into making gore fests I've found the splashes of blood in Dweller are nice touch. They let you know where you've been and help you feel your making your mark on the environment. A few additional uses that could be nice would be tracking wounded monsters through a dungeon, or as an aspect of magic - magic spells could have greater potency in areas were blood has been spilt, this could open up a few interesting stratagies. 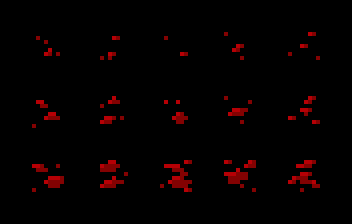 Any way, here are the tiles - they are intended to be used sequentially - meaning that each column represents a pool of blood as it gets wider as a fight progresses. Of course that's not really necessary, you can just spray blood all over town if you like. These might not be that useful to the majority of people - perhaps they would be best suited to touch screen interfaces, I dunno. At any rate, if you need a menu arrow, I should have you covered. 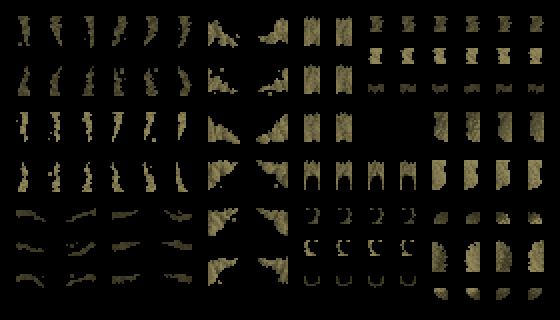 The second image is just to show the drop shadow - the next version of the sprite sheets will come in with shadow/without shadow flavours for sprites and furniture.